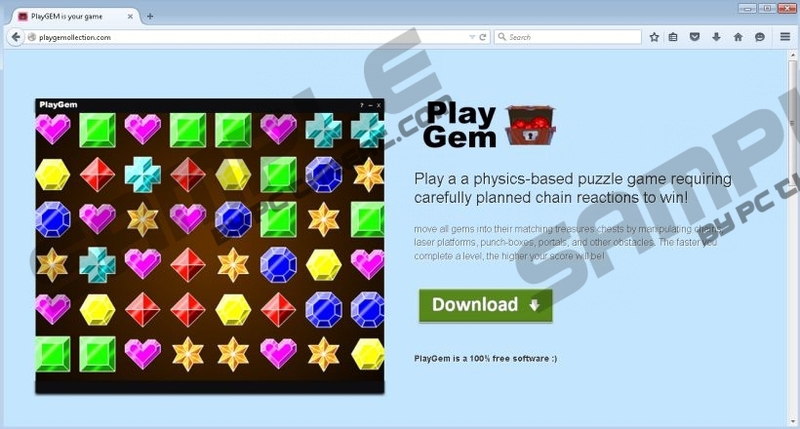 PlayGem is a program that supposedly enables users to play a game very similar to the popular Candy Crush. Even though this program is free, we do not recommend installing it. Our research has revealed that the supposedly reliable online game hides an unreliable advertisement-supported program that can inject advertisements into the sites that you visit. Have you expected this when downloading this program? We are sure that you have not, and you are right to be worried because most ad-supported programs require removal. Do you think you can delete PlayGem? In either case, we advise reading this report first. Playgemollection.com is the website that was created to represent PlayGem. Even though our researchers have not found this suspicious program to be promoted by third-party installers, it is highly unlikely that the official website is the only source it is available from. If you find PlayGem bundled with third-party programs, you must analyze these programs as well. The worst thing you can do is install programs without researching them first because this is all that cyber criminals need to infiltrate malware that you would have to remove. If you suspect that unreliable programs have corrupted your operating system, use a malware scanner to determine whether you need to delete malware. All other potential threats aside, PlayGem can be dangerous as well. This advertisement-supported program is very similar to another potential threat we recommend removing, MovieDea. Both of these programs can spy on their users with the help of web cookies that can be installed together with the app. More importantly, both of these programs can display suspicious and potentially unreliable ads. Our malware researchers have found that PlayGem is most likely to display advertisements right in the middle of the screen in sparse intervals. In fact, it is unlikely that you will see these ads more often than once an hour. Of course, this is one of the reasons computer users do not rush to remove PlayGem. There are two different risks that you might encounter if you keep PlayGem on your operating system. The ads injected by this program could lead you to sites controlled by schemers, which means that these ads might work as security backdoors. The second risk is associated with the cookies installed by PlayGem. As mentioned previously, these cookies might spy on you, but what you may be unaware of is that these cookies might collect personally identifiable information. If you want to learn more about this, you can go to playgemollection.com/privacy.html. It is very important that you consider both of these risks before you decide what you want to do with PlayGem. Needless to say, we recommend removing PlayGem. This program does not offer original services, and it can put your virtual security at risk, which is why we are surprised if you have not deleted this adware already. Our expert malware researchers advise inspecting your operating system before commencing removal. If you find many infections that you need to delete, it may be worth investing in automatic malware removal software. If you find only PlayGem, use the instructions below to delete this program, and install a security tool to ensure that you do not need to worry about suspicious programs and their attacks in the future. Launch RUN by simultaneously tapping Win+R on your keyboard. Locate the application you wish to delete, right-click it, and select Uninstall. Click the Start/Windows icon on the left of the Taskbar. Open the Control Panel menu, go to Programs, and click Uninstall a program. Click the Start icon on the left of the Taskbar. Quick & tested solution for PlayGem removal.